After finishing creating a scenario and adding a sample set to it, you may want to further change their descriptions (e.g. entering physical doses and coordinates for individuals). To do this, click the 'Edit scenario descriptions' menu item under the 'Scenario' menu. In the right panel, the top left table displays all descriptions entries of the scenario. You can double click a cell to edit its value (the 'sample set count' and 'creation date' description entries cannot be manually edited). Click the 'Add' button to add a new description entry. If you want to delete one or more description entries, first select them, then click the 'Delete' button. After finishing editing the descriptions, click the 'Save' button to save the changes. 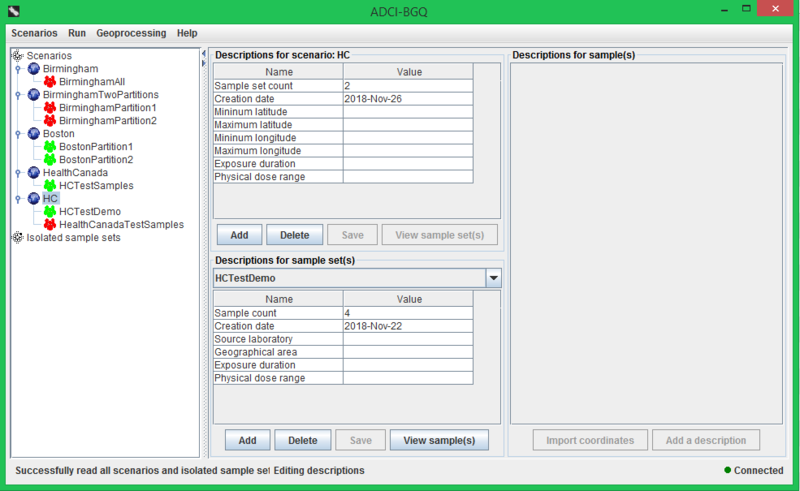 If the scenario contains one sample set, the 'View sample sets' button will be enabled; click it to view and edit the descriptions of the contained sample sets. After clicking the 'View sample set(s)' button, the names of all sample sets contained in the scenario will be filled into the drop-down list, and the bottom left table will display all description entries of the sample set currently being selected in the drop-down list. Similarly, you can add a new description entry by clicking the 'Add' button, and delete one or more entries by selecting them in the table and clicking the 'Delete' button. After finishing editing the descriptions of the current sample set, click the 'Save' button to save the changes. If you select another sample set in the drop-down list, the table will also update accordingly to display the descriptions of the newly selected sample set; if there are unsaved edits for the previous sample set, a prompt dialog will appear to ask whether you want to save the changes. To view and edit descriptions of samples contained in a sample set, first select it in the drop-down list, then click the 'View sample(s)' button. If there is a large number of samples, a dialog will pop up to display the detailed progress of retrieving their descriptions from the server. You can click the 'Cancel' button if you do not want to view the sample descriptions any more. The descriptions of all samples contained within the sample set will be displayed in the right table; each row corresponds to a sample, and each column is one description entry. If the sample set was processed and dose estimation was performed, each dose version (i.e. a combination of a calibration curve and an image selection model) will have a column, which displays the DC frequency and estimated dose of each sample under the combination. You can adjust the widths and order of columns. You can double click a cell to edit the value of a sample for a description entry, or a cell in the table header to edit the name of the description entry; the 'Name', 'Image count', 'Creation date' and dose estimation columns are not manually editable. The name of an description entry cannot be empty or identical to another existing one. You can enter the coordinates and physical dose of a sample when you create it, as described in previous sections; you can also use the 'Import coordinates' button in this panel to import coordinates and physical doses of many samples from a KML file at one time. In the KML file, a <placemark> tag corresponds to a sample; indicated by the button's tooltip, within a <placemark> tag, the value of the <name> tag should match the name of the sample, and the value of the <coordinates> tag within the <Point> tag should be in the format of 'longitude,latitude,physical dose'. Select the KML file in the popped-up file chooser and click the 'OK' button to import it. If there is already a description entry whose name contains the keyword 'coordinate' and an entry whose name contains 'Physical dose', the imported coordinates and physical doses will be respectively filled into these two columns; if they do not already exist, a new description entry with the column name 'Person coordinate (latitude,longitude)' will be added to the table to accommodate the imported coordinates, and a new entry with the name 'Physical dose' will be added to accommodate the imported physical doses. 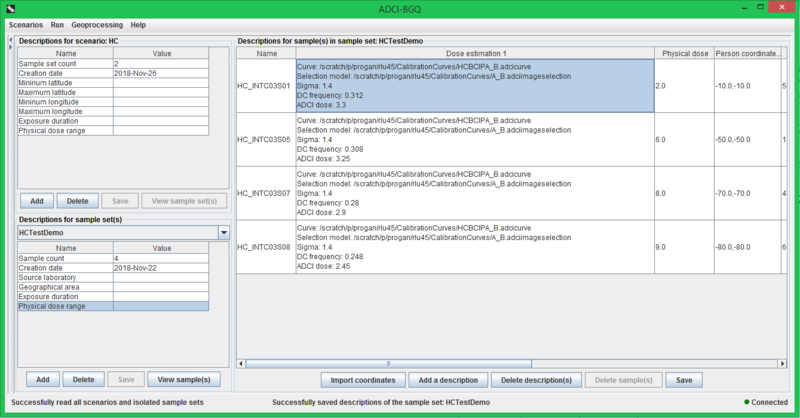 A summary dialog will appear to tell you how many samples are updated using the data from the provided KML file. Click the 'Add a description' button to add a new description entry (i.e. a new column) and enter its name. To remove one or more description entries, select one cell in each of these columns simultaneously, then click the 'Delete description(s)' button. If the sample set has not been processed, you can delete one or more samples from it by selecting the rows and clicking the 'Delete sample(s)' button. After finishing making edits, click the 'Save' button to save the changes. If you attempt to edit the sample descriptions in another sample set by selecting another item in the drop-down list and clicking the 'View sample(s)' button, and there are unsaved changes in the right table of the previous sample set, an inquiry dialog will appear to ask whether you want to save the changes.